This is an adaptation of a recipe found on Pinterest; not too sweet because I find that pulling back on sweetness by using less Splenda is preferable to metallic Splenda flavor! These are a bit crumbly but if you can't eat regular peanut butter cookies, I think you'll still enjoy them. Mix first four ingredients until paste-like and uniform. Stir in chocolate chips. Scoop onto baking sheet (makes 12). 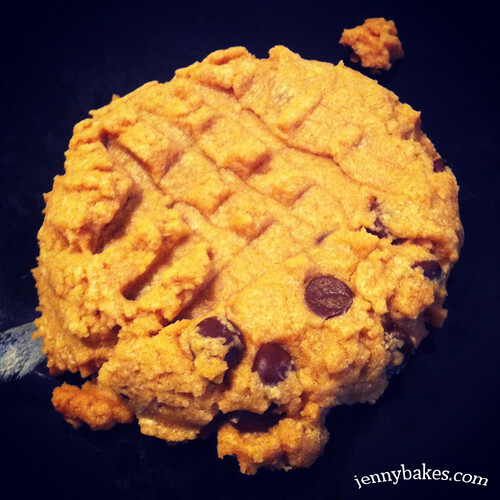 Press down with fork to make the peanut butter cookie marks. Bake in preheated 350 oven for 8-10 minutes.